Cook spinach as directed on package; cool. Squeeze water from spinach; discard water. In large bowl, mix all ingredients except bread. Cover and refrigerate at least 1 hour to blend flavors. Just before serving, cut a 1- to 2-inch slice from the top of the loaf of bread. Hollow out the loaf by cutting along the edge with a serrated knife, leaving about a 1-inch shell, and pulling out large chunks of bread. Cut or tear the top slice and the hollowed-out bread into bite-size pieces. 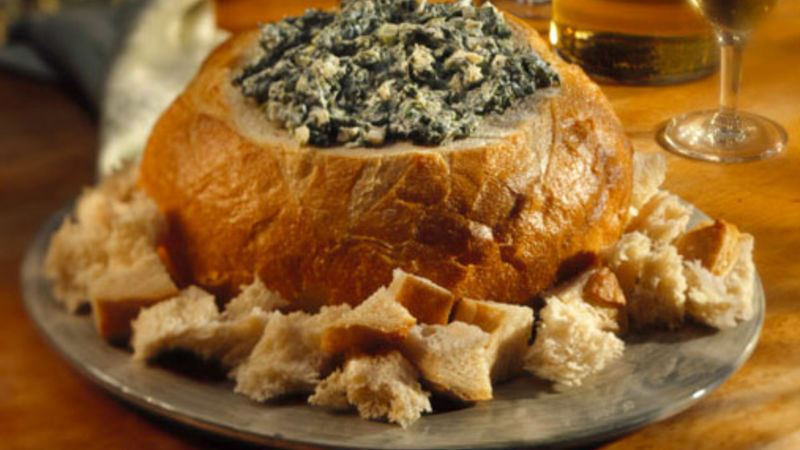 Place bread on serving plate; fill with spinach dip. Arrange bread pieces around loaf to use for dipping. A loaf of rye bread looks nice filled with the Spinach Dip, but white, whole wheat and multigrain breads also taste delicious with this snack.